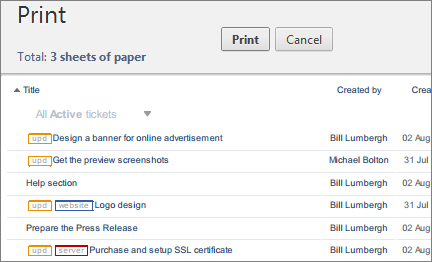 You can print out a ticket information, with all the notes, from Edit/View Ticket window using the print function of your browser (CTRL+P). The same applies to the List View. Now the layout and formatting of the printed version has been improved to look/fit better on the paper. Next post: Featured client: U-Fab, Upholstery & Fabric Stores Inc. Previous post: Submit tickets by email, through external form and even from non-registered users!